Fruit; medium, roundish, a little flattened. Skin; deep yellow, tinged red next the sun, streaked with red, dotted all over with russety dots. Flesh; yellow, crisp, brisk, juicy, sugary. [HP pl.XLIX/1878]. A very old variety of unknown origin, the large number of synonyms attesting to its age. A vigorous and abundant bearer. Available November to April. ‘A fine old dessert apple of first rate quality.’ [HP pl.XLIX/1878, Gard, Chron/1848]. 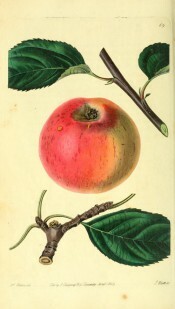 ‘This excellent Apple has long been known in our Gardens, having been spoken of by the earliest English writers upon gardening. It must not be confounded with the Reinette Dorée of the French, nor with the Apple bearing the same name in Holland, both of which are distinct from this, and also from each other, but equally deserving cultivation. This sort bears unusually well in our climate; its blossoms suffer less from spring frosts than those of many varieties. The fruit is a valuable winter kind, ripening in the end of October, and keeping till the end of January, or even later, after hot, dry summers.’ [PM t.69/1829]. ‘A red and yellow middle sized fruit, splendid flavour, and should be included in every collection.’ [David Crichton. NHM vol.1 p60/1864]. Listed in the 1845, 1850 and 1857 catalogues [Apple no.27/1845].